Combines a Telephone Line Distribution Module (not available separately), a Category 5e Voice & Data Board (47605-C5B), and a 6-way 2 GHz Video Splitter in a dedicated plastic bracket for multi-line systems with video distribution. 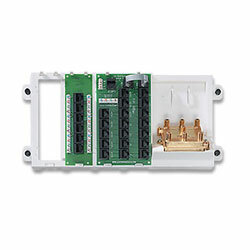 Provides two to four lines of service to up to 19 connections when combined with other modules. Route video to 6 locations, and voice and data service to 6 remote locations via Category 5e Voice & Data boards.